Some "world cities" brassily proclaim their status and pay by the billions to lure trade and culture. Then there are those cities of the world forged so naturally that they don't seek or need labels. One of these is Spain's Cádiz  still a lesser-known European destination and until recently one of the more far-flung, though it now sits accessibly at the end of high-speed train lines barely three hours from Madrid. Compressed into one organic whole of 130,000 souls on a tiny spit of peninsula jutting into the Atlantic, a magical mix of influences  Phoenician, Roman, Arabic, Napoleonic  still brews within the narrow lamplit streets of this port town. There's even a hint of the Americas via explorations launched from there, with affinities to everywhere from New Orleans to Valparaíso. Here are five Cádiz essentials. This is the most atmospheric and active of the old city's many pleasing squares, and the site of a comprehensive history museum  from ancient coins to Miró, closed Mondays, tel: (34-956) 203 368. But the real attractions are the living exhibits of the square itself. Every evening, it's transformed into a giant civic front room, where everyone from football-kicking tykes to contemplative grannies join a merry hubbub that resembles a movie director's dream of street life. Most renowned of many robust local taverns, Casa Manteca, tel: (34-956) 213 603, is the best spot for special hams, blood sausages, cheeses and the specialty chicharrónes (lemon-flavored slices of fatty pork), all procured from closely guarded sources in provincial mountain villages and forming the perfect accompaniments to sherries from the barrel. The walls are lined with photos of bullfighters and flamenco luminaries, with further local flavor provided by a lively neighborhood crowd, strolling minstrels and show-off bartenders. Cádiz boasts plenty of beaches along its southern approaches, but this single sweep of sand, guarded by ancient fortifications (castles named San Sebastián and Santa Catalina), offers decent dipping and a glimpse of brashly oversized and underdressed Andalusians at play  all barely five minutes' walk from hushed university classrooms and cathedral naves. The seafood restaurants that front the changing rooms offer a major upgrade to the usual beachside snacking, putting out deep-fried specialties from sardines and sea bass to cuttlefish. A much storied, double-decked wooden steamer, ever rumored to be phased out in favor of soulless catamarans, El Vapor de El Puerto (or El Vaporcito for short) lends romance at bargain rates to the 45-minute crossing to El Puerto de Santa María  a palm-fringed yet pleasantly decrepit marina town whose atmosphere, like that of Cádiz, often seems more New World than old Spanish. El Vaporcito usually runs every two hours. For the schedule, call (34-629) 468 014. 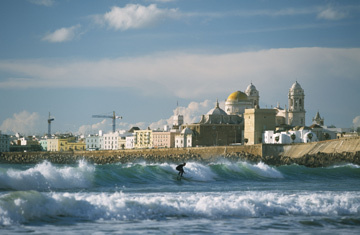 Much as it faces out to sea, Cádiz remains smack in the center of the gypsy flamenco heartland. The music and dance form is showcased in concerts held in regal seaside botanical gardens every Thursday night through July and August. Concerts are also often held at the Gran Teatro Falla, named for that most Spanish of classical composers and the favorite son of Cádiz, Manuel de Falla.